I woke up on Saturday to find I had a front page story in The Age. It’s about Scienceweek and a campaign the Mount Burnett Observatory Association is involved in where the public can suggest names for newly discovered exoplanets – planets in solar systems other than our own. The real kudos should go to photographer Eddie Jim for capturing these beautiful images. You can read the full story here and follow Eddie on Instagram here. But thanks also to keen-eyed reader Andrew who got in touch to pick out my erroneous use of ‘law’ in paragraph eight – it should be ‘lore’, of course. I’ll try and do better in the future (particularly because the newspaper industry already has sub-editors under immense pressure and I can’t see that position improving). We didn’t have enough room in the story but it was fascinating talking to former professional astronomer Andrew Murray about the possibly of life on other planets. In a nutshell, it’s not really a question of whether there is life on other planets (statistically it’s a yes) but more that these exoplanets are so far away we are unlikely to ever be able to travel to them. 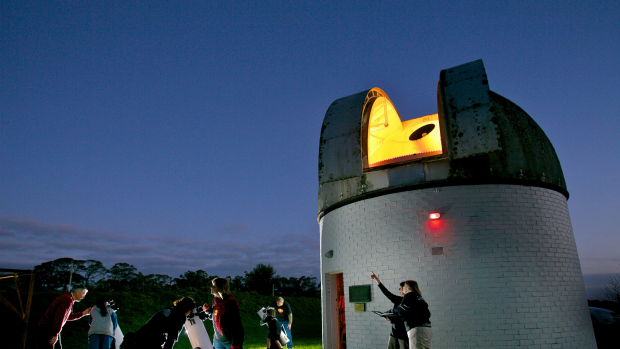 The Mount Burnett Observatory is open every Friday evening from 8pm. Entry is free, see mtburnettobservatory.org. For details of free Science Week talks see scienceweek.net.au. And here’s a link to a great story on saving the Mount Burnett Observatory that appeared on ABC television the night before.